The pop-up Fragrance Bar is an excellent accompaniment or main feature at your corporate entertainment event (50+ guests). 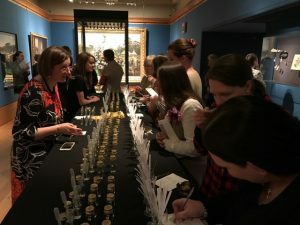 It is especially suitable for events where guests can network or mingle and “drop in” or “call by” the Fragrance Bar to design and create their own perfumes at their leisure. The eau de parfum are unisex and very cleverly blend with each other. Guests are invited to visit the “pop-up bar” where all 21 of the worlds’ finest perfume blends are displayed for sampling. A bit like a wine or whisky tasting, Alison and her team have a brief discussion with your guests about their favourite fragrances and what they like about them. This helps ascertain the individual’s olfactory repertoire and enables your guests to be guided towards the individual notes they would like. After sampling a few of the perfume notes at the Fragrance Bar, your guests then choose their favourites and are expertly guided to create their own individual and unique perfume formula. This will be custom blend enabling your guests to away a 5ml eau de parfum bottle of their new creation from your event. Details of the individual’s recipe is retained on file as a record of their attendance at the Fragrance Bar and refills will be available in the future. The Fragrance Bar is suitable for entertaining clients, staff rewards and incentives in Glasgow, Edinburgh and major cities throughout Scotland. The Fragrance Bar pricing is tiered for up 50 guests#, 51-99 guests and 100+ guests. Pricing is based on your event running for up to 4 hours.